On 9 December 2012, the delegation of the Russian Orthodox Church, led by Metropolitan Hilarion of Volokolamsk, chairman of the Moscow Patriarchate’s Department for External Church Relations, took part in the funeral ceremonies on the occasion of the demise of His Beatitude Patriarch Ignatius IV of Great Antioch and All the East. Officiating at the funeral service in the Cathedral of St Nicholas the Wonderworker in Beirut were His Holiness Patriarch Bartholomew of Constantinople, His Beatitude Archbishop Chrysostomos of Cyprus, and His Beatitude Archbishop Anastasios of Albania. 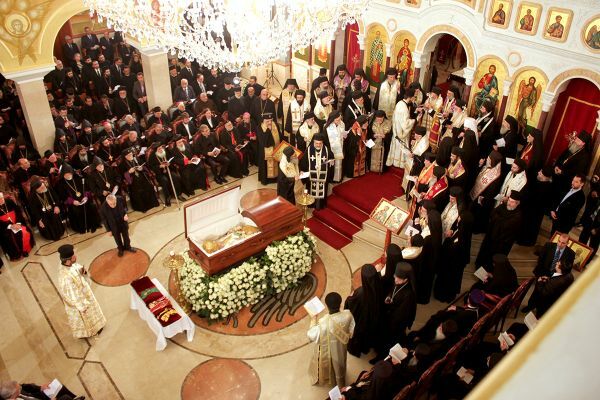 Taking part in the funeral service were also delegations of the Local Orthodox Churches, led by Metropolitan Nicholas of Hermopolis (Patriarchate of Alexandria), Metropolitan Benedict of Philadelphia (Patriarchate of Jerusalem), Metropolitan Stephan of Tsageri and Lentekhi (Patriarchate of Georgia), Bishop Antonije of Moravicí (Serbian Patriarchate), Archbishop Casian of Lower Danube (Romanian Patriarchate), Metropolitan Ioannis of Langadas (Greek Orthodox Church), and Bishop Irénée of Quebec (Orthodox Church in America). The prayers included Paschal hymns, according to the tradition of the Antiochian Church, and were said in the Arabic, Greek, Church Slavonic, Serbian, Georgian, and Romanian languages. Present in the Cathedral were also Mr. Michel Suleiman, President of the Republic of Lebanon; Mr. Najib Azmi Mikati, Prime Minister of Lebanon; heads and representatives of non-Orthodox confessions; H.E. Mr. Alexander Zasypkin, Ambassador of the Russian Federation to the Republic of Lebanon; other members of the diplomatic corps, accredited to Beirut; numerous clerics and laymen of the Patriarchate of Antioch; and public figures of Lebanon and Syria. After the funeral service, His Holiness Patriarch Bartholomew of Constantinople, His Beatitude Archbishop Chrysostomos of Cyprus, and His Beatitude Archbishop Anastasios of Tirana and All Albania addressed the members of the Holy Synod of the Antiochian Orthodox Church with the words of condolences over the bereavement that has befallen the Church of Antioch. Today we give our last honours to the eldest first hierarch of the Orthodox world – His Beatitude Patriarch Ignatius IV of Great Antioch and All the East. All the kinsfolk in the flesh and the brethren in the spirit, friends and wonted acquaintance weep, sigh and wail (the Office at the Parting of the Soul from the Body) over his demise. Sincere grief has filled the hearts of hierarchs, clerics and faithful of the Church of Antioch and of other Orthodox Churches, who knew well and loved His Beatitude, a most renowned leader of the modern Christian world. His Beatitude gained authority over wide circles of church community due to his deep knowledge of theology, profound ideas and thoughts, and due to his tireless work for preaching the Gospel of Christ. Wherever His Beatitude Patriarch Ignatius performed his archpastoral ministry, be it at the ancient See of Palmyra, in the Laodikia diocese, or at the glorious Throne of Ss Peter and Paul, he did it with exemplary zealous care for the vineyard entrusted to him by Christ. The Orthodox Church of Antioch, which he led, had been for a long time the largest Christian community in the East and is still the stronghold of Orthodoxy in the region. It is not without reason that God’s City of Antioch is called the eye and gate of the East. For the peoples of the Middle East, the 20th century was the time of political and social upheavals, and ethnic and confessional picture in the region has changed. Social transformations also affected religious communities, including the Orthodox Church of Antioch. It was in the period, when the Church of Antioch had to give a clear response to the challenges of the epoch, that the Lord granted Her such Primate as His Beatitude Patriarch Ignatius. His Beatitude defended the principles of peaceful coexistence of representatives of different faiths and cultures and contributed greatly to upholding the cause of peace in the Middle East in the years when the ancient biblical land once again became the centre of dramatic events which to a large extent determine the development of human civilization. One of His Beatitude Patriarch Ignatius’s most important deeds was the establishment of the University at the Balamand Monastery. The University has become a major educational centre in the Eastern Mediterranean. His Beatitude paid much attention to the spiritual education of youth. Already in the beginning of his church work, he played an active part in youth movement which was developing in Lebanon and Syria and which gave the Orthodox Church of Antioch new sources of inspiration. Under the leadership of His Beatitude Patriarch Ignatius, many new monasteries and churches in Syria and Lebanon were built, ancient abodes were revived, and large-scale catechization work was launched. His Beatitude paid much attention to the development of Christian mission in the regions of Orthodox diaspora. Millions of Orthodox Arabs, who live in Western Europe, America and Australia, got shelter in the parishes of the Antiochian Church. The Church of Antioch has played a very important part in the life of Universal Orthodoxy thanks to Her faithfulness to spiritual traditions and ability to bear witness about Christ in the language that our contemporaries can understand. She has gained rich experience of fraternal contacts and cooperation with the Local Orthodox Churches. I cannot but say about the special relations between the Church of Antioch and the Moscow Patriarchate. We have always had close relations which were strengthened even more in the years of His Beatitude Patriarch Ignatius’s primatial ministry. His Beatitude was the guest of the Russian Orthodox Church on numerous occasions. The faithful of our Church knew him well, sincerely loved him, and highly appreciated his peacemaking endeavours and his contribution to the strengthening of Orthodox unity. I have personally known His Beatitude for many years. With special warmth I recall our recent meetings in Syria and Lebanon, his hospitality and brotherly love. I know how deeply His Beatitude suffered because of the tragic events in the Middle East, how he grieved for innocent victims, and how ardently he prayed for the re-establishment of peace and brotherly love. I believe that the All-Merciful God will hear His faithful servant’s supplications. May the soul of the recently departed Patriarch Ignatius rejoice in Christ and may the Lord give him eternal rest and grant him a dwelling where the light of God’s countenance shall visithim. President of Lebanon Mr. Michel Suleiman expressed his condolences to the members of the Holy Synod of the Orthodox Church of Antioch. Cardinal Paul Poupard, Honorary President of the Pontifical Council for Culture, read out the message of condolence from the Pope of Rome, Benedict XVI. Then the funeral procession with the coffin of the departed Primate of the Orthodox Church of Antioch left Beirut for Damascus. The procession included the members of the Holy Synod of the Orthodox Church of Antioch. On Monday, December 10, the ever memorable Patriarch Ignatius will be buried in the sepulchre of the Antiochian Patriarchs, located in the territory of the Patriarchal Cathedral of the Assumption, in the historical part of Damascus. In the evening of December 9, the delegation of the Russian Orthodox Church left Beirut for Moscow. At the airport, Metropolitan Hilarion was seen off by Archbishop Niphon of Philippopolis, representative of the Patriarch of Great Antioch and All the East to the Patriarch of Moscow and All Russia, and by Mr. Alexander Zasypkin, Ambassador of the Russian Federation to the Republic of Lebanon.